The first and second editions of this classic book showed readers how to develop their own unique vision of the good life—which Leider and Shapiro define as "living in the place you belong, with the people you love, doing the right work, on purpose"—and take practical steps to achieve it. Inspired by a spirit of travel and adventure, it uses packing and repacking your bags as a metaphor for deciding what you really need in your journey through life. So why a third edition? Because the world has changed. 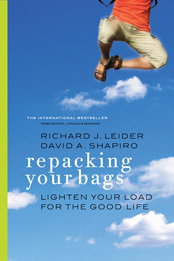 When they wrote the first two editions, Leider and Shapiro assumed that repacking was something people might do once or twice in their lives. But technological advances, major economic shifts, longer life spans, and changing social roles are revolutionizing the way we live and work. Today we have to repeatedly unpack and repack as the inevitable shifts and surprises life has to offer continually unfold before us. With each step along the way, we must reexamine what has brought us here and continue asking ourselves if the choices that have sustained us so far are continuing to do so—or if they're just weighing us down. This new edition has been thoroughly revised and reimagined with this lifelong focus in mind. It contains new stories and practices for repacking your four critical "bags"—place, relationship, work, and purpose—as well as a new Repacking Journal for planning your "trip" and Leider's immensely popular Calling Card exercise for identifying your gifts, passions, and values. Repacking Your Bags reminds all of us to regularly ask why we carry what we do and try to lighten our loads—because the good life is worth striving for at every age.